In 1890 a Pennsylvanian named C.H. Waterhouse bought land on the west bank of the Colorado River. He used the river to irrigate his land for the growing of cane and was said to have had the largest pumping plant in Texas at the time. Waterhouse brought German farmers from his native Pennsylvania to work the land on shares. The people were given five acres for a church and cemetery and they called their community Vesperville. In 1895 they built St. John's Lutheran Church in Vesperville and it went through an extremely rough period. The building was hit by a hurricane in 1909 and the next year it was ripped apart by a tornado. Eight years later it was destroyed by fire and the congregation felt it might fare better in Glen Flora. They moved it there in 1919, but it was destroyed by another tornado in 1929. Finally they moved it to its present location in Wharton in 1941 and renamed it St. Paul's. Glen Flora proper was established across from the sugar plant in 1898. The plant had undergone several name changes by this time as business partners came and went. Waterhouse himself served as president of the newly formed Glen Flora Town Company in 1902. The plant got permission from the county to build a rail line across the Colorado River Bridge to the Cane Belt Railroad tracks. This spur helped move cotton and sugar to the main line with cars drawn by mules. As sugarcane production diminished, the line was no longer needed and was removed. In 1991 the Santa Fe railroad (which had acquired the Cane Belt in 1902) pulled up the tracks of the main line and the right of way returned to private ownership. 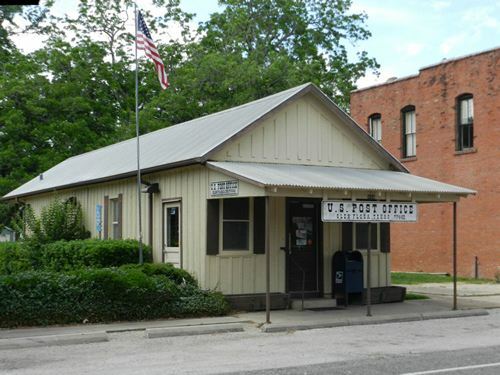 The Glen Flora Post Office which was first opened in 1900 - been spared the fate of so many small town post offices. It was to be turned into one of the modular monstrosities that are polluting the Texas landscape - but through the valiant efforts of certain townspeople, they were able to retain the dignified little building that has served them for these many years. Although the modular units are tight, insulated, weatherproof and they may also float and contain life support systems - one fact remains - they are still ugly. Congratulations to the citizens of Glen Flora who just said no to ugliness. William Hood came to Glen Flora and went into the Mercantile Business with R.M. Martin. Martin had been Secretary of the Glen Flora Town Company. They were doing a brisk business when the Geo. Northington Store opened up across the street in 1903 (or 1905). The name of Northington is woven tightly into the fabric of nearby Egypt, Texas. Hood and Martin had a fire in March of 1912 that did $ 9,000 damage to the building and destroyed $ 35,000 worth of merchandise. They rebuilt in the form of a grander three-story building. The building contains a rare buggy elevator. The buggy showroom was on the second floor while domestic and yard goods were on the ground floor. Today the Antique Emporium (beside their interesting antiques) is also a spot for indoor birding. The 1913 Flood was so bad even the traditionally dry San Bernard River flooded. It has been called "The flood that washed away East Waco" but its devastation extended all the way to the coast. At Glen Flora the town was covered with 3 feet of water and the $17,000 county-owned bridge over the Colorado River washed out. It had to be replaced with the help of the railroad. The standing water might've been a relief if it arrived in July, but the flood occurred on December 6th. The force of the water was such that it washed away the collected silt in the cotton fields to where the old six-foot rows (dating back to 1869) were exposed. The River crested at 44.65 feet and the railroad tracks were upended so that they "looked like a picket fence."